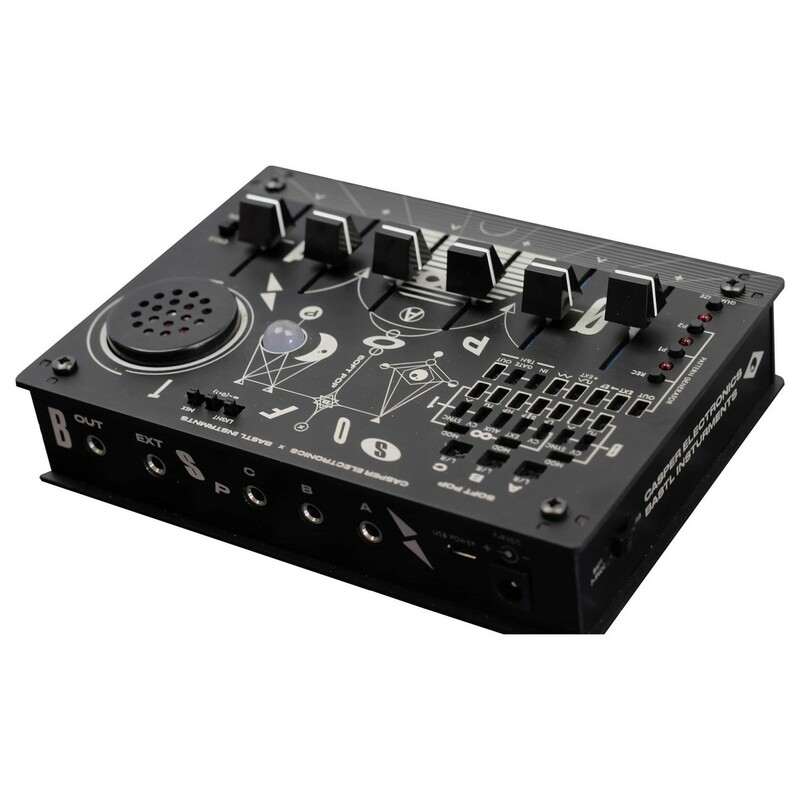 The Bastl Instruments SoftPop is a compact and portable analog sound synthesizer featuring two VCos and a VCF. The SoftPop is ideal for sound design applications, with its semi-modular design and 6 smooth faders. The 6 faders are used to control the dual VCOs and VCF, allowing you to blend between modulation. The dual VCOs are comprised of two wide range triangle-cores, accompanied by the resonant state variable VCF (bandpass, lowpass, highpass) for added versatility. It features an on-board looping pattern generator as well as a track and hold circuit for stepped modulations. It also boasts a built-in speaker for added convenience and portability. The Bastl Instruments SoftPop is a compact and robust analog synthesizer and noise experimentation machine. The SoftPop features dual VCOs and VCF, with VCOs utilising two wide range triangle-cores and the VCF providing bandpass, lowpass and highpass settings for optimal flexibility. The SoftPop is ideal for a range of sound design applications, from experimentation to creating new sounds for use in music productions and everything in-between. The fully analog core and signal path ensures that classic warmth and grit normally associated with vintage synthesizers. It features 6 faders in total, designed for controlling the VCOs and VCF as well as their cross modulations. There is also a quantizer for VCO 0, which acts as an auto-tuner. You can achieve everything from sound FX to powerful and gritty basslines. One of the most unique features of the SoftPop Analog Synth is the track & hold circuit, which allows you to achieve stepped modulations. 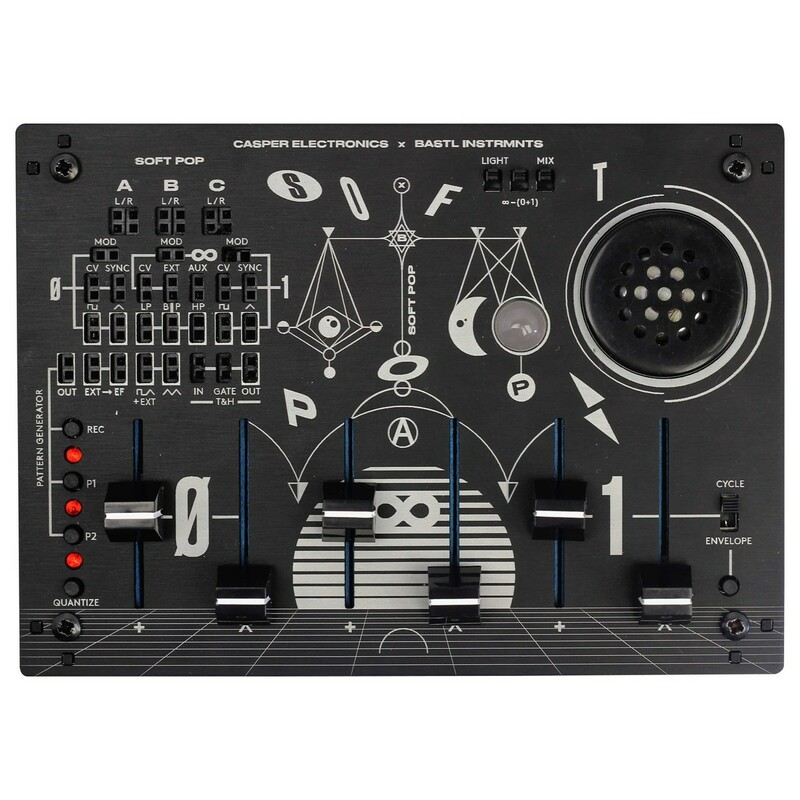 This is ideal for creating patterns and rhythms in conjunction with external synths/sequencers. In addition to this circuit, this synth also boasts a looping pattern generator with two patterns: P1 and P2. This is ideal for create loops on the fly, with ease. This breathes new life into your sounds, creating movement within your tones for added flare and overtones. The rear of the unit also features a secret hack chamber for modding the synthesizer. The comprehensive control section comes complete with a 25-point patchbay, providing a wide range of connection options. The mini integrated patchbay includes 3 jacks labelled A, B and C, which you can use to send signal in our out of the patch bay. The most convenient feature of the SoftPop is the integrated speaker, which eliminates the need for external speakers. It also adds to the unit’s portability, allowing you get setup and making sounds anywhere you go. The SoftPop can also process external audio through the filter, whilst using the envelope follower to synchronise the incoming signal for added versatility. The highly compact design makes the SynthPop highly portable, great for live performance and use on the road. Its ultra-rugged aluminium casing, utilises laser engraving for the clean and sleek finish. The side of the case features wheels for changing the volume and external volume of the synths. The front of the case features fine-tuning and feedback wheels for added modulation control. The ergonomic layout features a psychedelic-style red LED light, designed for indication of a range of parameters including the pattern generator and more. The potentiometers and faders are constructed from high-quality materials designed for optimal durability and longevity. It can also run via a DC plug, USB power or 4 x AA batteries for added flexibility.